The majority of musicians, even those who score legitimate hits along the way, aren’t remembered much longer than those hits are played on the radio – or for our purposes on jukeboxes in rock music circa 1949, since radio largely wouldn’t touch this stuff at that time. For guys who didn’t sing, session musicians who managed to scored a handful of singles themselves, their name recognition had an even shorter lifespan than that. Like milk left in the sun it wasn’t going to last long. At least it wouldn’t without a gimmick of some kind. Well not a gimmick exactly, as in a cheap exploitative trick, but rather something to jog the memory after their time in the spotlight had passed. I mean, that’s why you’re here isn’t it? At least those of you who’ve come to Spontaneous Lunacy for the first time by means of a search engine query for Frank “Floorshow” Culley and landed on this page? This is what his career gets reduced to I suppose, a colorful name and a corresponding record to highlight it, but then again that he gets remembered at all is more than most in his line of work – especially from this era – can say so I suppose he can hardly complain. So if this record IS his legacy for a lifetime in music then it’s got a lot riding in its grooves to ensure that his epitaph will be a good one. Of course no artist should be reduced to just one record and around here that’s certainly not the case. This is Culley’s third single being reviewed already and he’ll have plenty more to follow. He’s also appeared on records of other bigger name artists in a supporting role and in the future he’ll perhaps make an even greater mark in that realm than he will on any of his own records, this one included. But it’s this record that keeps his name from being completely obscure seven decades after he cut it and that’s a pretty good feat for one that didn’t even make the charts let alone become a sizable hit. Even this record though has plenty of misinformation associated with it in regards to it being the reason why his name is moderately familiar among rock history buffs. But as we covered extensively in our first meeting with Culley on Ready For Action back in the fall of 1948 it wasn’t this record from nearly a year later which gave him the nickname “Floorshow”, but rather his nickname is what gave this record ITS name. Culley was a tenor saxophonist who’d made his reputation in clubs with a flamboyant playing style, thus giving him the nickname which served as a way to publicize his appearances and give curious patrons a reason to check his act out. It also gave record companies seeking to capitalize on the booming tenor sax revolution in late 1940’s rock a reason to sign him, as Continental Records did last year. But they were a small company who saw their records leased to Lenox Records, another small outfit, but neither imprint was going to propel Culley into the big time. The same probably would’ve been said at the time about Atlantic Records, his next stop as a featured performer, since at the time they signed Culley to a contract they’d had only one small hit by Tiny Grimes in their first year in business but their fortunes were about to change, in large part thanks to Frank “Floorshow” Culley himself. If Atlantic’s ultimate ascension to the top of the independent label sweepstakes seemed somehow preordained when looking back from the Twenty-First Century after years of self-aggrandizing promotion by its founder Ahmet Ertegun, it helps to remember that they hadn’t exactly set out to conquer rock ‘n’ roll with any definite intent. In fact, they more or less lucked into it… repeatedly. Their two biggest selling artists initially were both former jazz musicians: Guitarist Tiny Grimes, who scored their first hit Midnight Special in the fall of 1948, and trumpeter Joe Morris, who’d had some locally big sellers for them starting with Lowe Groovin’ earlier that year. Both however had been cutting plenty of jazz-based material as well which surely is what Atlantic felt would sell, only to find that it was the rock sides that scored with the public. You’d think that would tip them off that this was something to actively pursue, which seemed to be the case when some quick thinking landed them the services of Stick McGhee, who’d scored their first major hit with Drinkin’ Wine Spo-Dee-O-Dee last March, a classic rock side that Ertegun never tired of talking about years later. Yet he never mentioned how they’d shelved the only other rock side McGhee had laid down at that session which would’ve made for a perfect follow up to that earlier hit and instead the label put out McGee’s fairly mediocre country blues songs they somehow thought would be better received. Every success story is bound to have some good fortune along the way so we can’t fault them for being lucky along the way and we certainly can’t expect them to be able to see into the future more than would’ve been possible for a company struggling to make ends meet with a rag-tag collection of artists in a rapidly shifting marketplace that was busily discarding the long-established styles in favor of something more raw and experimental in nature. But if Atlantic wanted to earn the credit they’ve had bestowed upon them for the last half century or so then there had to be some sign early on that they knew what they were after musically and pursued it consistently at all costs. The truth of the matter is, they don’t have that… not quite and certainly not yet. The shift in their thinking seemed to have come with the arrival of Frank Culley. Not that he turned their heads around completely or anything, even as his debut for the label, Cole Slaw, was a Top Ten hit on the heels of the McGhee record, but rather unlike those others who’d notched some sales for them, Frank Culley was never anything BUT a rock act and so they had little choice but to follow that path with him and in the process their style as a company began to take shape. He wasn’t the only one responsible by any means, not with Jesse Stone on board as Atlantic’s newly hired all-purpose writer/arranger/producer who methodically developed much of rock’s signature style single-handedly, but it was Culley who enabled them to have an artist whose full-focus would be on this upstart brand of music epitomized by Floorshow, a record that aims squarely at the sounds that were making waves in rock. In many ways this record is a blueprint of what’s already worked in rock instrumentals rather than an audacious creative leap into the future. But Floorshow is far too good to be called generic, so instead let’s just say it’s perfectly emblematic of what we as rock fans – or rather our great-grandparents who were hip to this at the time – wanted and expected to hear when punching the jukebox number for a sax-led rocker. The horn itself needs to start off strong, with full rich tones and emphatically played notes to distance it from the lighter jazz-pop fare that proved to be the downfall of many a record that hoped to keep one foot in that more respectable genre, and Culley doesn’t disappoint in that regard. He opens the song with a decidedly muscular sound, his tenor sax highlighting the rhythmic aspects of the tune with the funky stop-start pattern before launching into the melody ten seconds in following two crude blasts from the lower register. That rhythm is what’s important and once he shifts his focus something else is going to have to pick it up, whether it’s a piano, as many sax instrumentals have done, or better yet the drummer, who thus far in rock has been a somewhat underutilized role. When done right it’s elevated everything it touches, but too often the jazz-mindset prevails and the drummer rides the cymbals and forgets about keeping a beat. Not so here, where he keeps a simple, but steady backbeat going throughout the song. Rudimentary playing though it may be, it’s also exactly what is called for to make sure you keep grooving along to it as Culley improvises over it. If your shoulders are moving then whatever Culley does to make up for it won’t be nearly as effective and here they never lose sight of that directive to never let up. Now there are others here, including a piano and bass, but they’re echoing the drums more or less, reinforcing the steady beat. You don’t notice what each are doing individually but collectively they’re always in your head. Which brings us back to the man at center stage whose job it is to deliver something that is at once melodically interesting enough to hold our attention and raunchy enough to get us excited. Too often horn players tend to lose focus on one or the other, sticking to trying to impress us with how well they play that they forsake the needs of the audience to grind, stomp and sweat out on the floor, or they become so focused on startling us with the musical obscenities found in the extreme highs and lows of the instrument that they have nothing to attach it to. Culley’s skill here is to walk that fine line without wavering. The melody more than holds up on its own and even though it may not contain any riff that will embed itself in your brain for eternity it all sounds as if it was worked out in detail beforehand. Everything fits in other words, there’s no meandering passages to wade through here, no detours into something aspiring to a higher class clientele or done to show their more snobbish peers that they really look down on this noise and are only condescending to play it so they can pay the bills. Floorshow picks a route and follows it to its destination admirably. As for the more unrefined touches that are designed to pique your interest and turn your head, Culley gives us just enough to qualify without jumping into the gutter with both feet and rolling around with the more boorish practitioners (though by no means is that an insult in this world) in an effort to see who can offend the most unsuspecting listeners with every honk and squeal they can muster. Culley picks and chooses his spots and usually does so more by ramping up what he’s already delivering rather than coming up with sudden interjections that are obvious in their intent. Even when he does start getting a little more unhinged a guitar (none other than Tiny Grimes himself) comes along to trade back and forth with him and return him to earth. You may not find yourself worn out after listening as you’d would with the most audacious sax fiends on the scene, but everything is so well-proportioned that you’ll gladly go back for more, whereas the rampaging records of some of his peers might bring more visceral excitement but will require a cooling off period before you’re up for another go-round. Records like this may not be the ones destined for immortality but in many ways they’re equally important because they’re what establish the standard of the better grade output a style produces at the time. Floorshow does exactly what is required to suit every rock fan’s needs in the summer of ’49 without ever tripping up, even for a second. If it falls short of the best of its ilk and as such doesn’t go down in the history books as a certified hit, that’s okay, because what it did instead was help to keep Frank Culley’s name relevant in those same books. It also let Atlantic Records see the value in meeting the demand for rock songs that don’t aspire to be anything more than rock songs, which might be its most vital lesson in the end. If the key to becoming immortal, whether as an artist or a record label, is being ahead of the curve, you still need to remain in position to take advantage of those moments when they present themselves. To do that you need consistent output that keeps you relevant as you wait for those immortal records that will get you ahead of the field. Until now Atlantic was working from too far back in the pack and so when they did get lucky it only brought them back into the race. Culley was the guy who kept them there, maintaining the pace they’d need so that when they struck next it’d get them out in front where they’d stay for a long, long time. 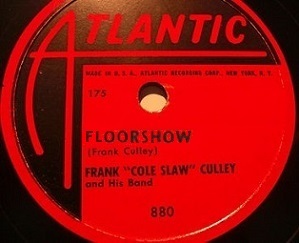 Leave a reply on "Frank Culley: “Floorshow”"